Overview - What time is it? It's time for Adventure Time! Cartoon Network's #1 hit comedy show and Emmy-nominated series centers on the post apocalyptic adventures of Finn (voiced by Jeremy Shada), a human boy with a funny hat, and his friend Jake (John DiMaggio), a magic and mischievous dog. The Blu-ray includes all 26 episodes from Season 1 and tons of special features by Ward. The first season also comes packaged with a collectible slipcover and is a must have for any Adventure Time fan. Be sure to check out our review of the simultaneously released Season Two set as well! There are a lot of great shows on TV, but it's increasingly rare to find something truly unique; something so singular in execution and artistic voice that it almost defies description. 'Adventure Time' is one of those shows. In fact, Pendleton Ward's utterly bizarre and irresistibly charming Cartoon Network animated children's program just might be one of the best shows on TV. No, really. I mean it. Heavily inspired by Dungeons and Dragons, anime, videogames, fairy tales, and classic adventure plotting, the series is an explosion of unbridled creativity and delirious wit that's unlike anything else on television, creating a world of limitless possibilities and off-beat humor that manages to appeal to audiences of all ages. The show tells the story of a heroic twelve year old boy, Finn the human (Jeremy Shada), and his best friend, Jake the dog (John DiMaggio), who can talk and happens to have magical stretching powers (think Mr. Fantastic but with paws). The pair live in a surreal fantasy world called Ooo which may in fact be a post-apocalyptic, distant future version of Earth. Throughout the twenty six episodes that comprise the first season, the duo of adventurers fight evil, save princesses, and get into a whole mess of trouble, usually under increasingly bizarre and random circumstances. Like its name implies, the core of the series really couldn't be any simpler. This is a show about adventure –- big and small. Each eleven minute episode features a new tale that sees Finn and Jake tackle various challenges like fighting off a horde of zombie candy creatures, training to be wizards, tracking down legendary items, or continually thwarting the devious Ice King's repeated attempts to kidnap potential brides. Throughout it all, the writers play with various genre tropes and archetypes, taking heavy inspiration from role playing games to form a fun, frequently nonsensical and manic questing logic all their own. To this end, the show doesn't play by conventional narrative rules, and many episodes end rather abruptly with seemingly unfinished threads. Though that might sound potentially irritating, this occasionally incomplete feel only helps to enhance the show's quirky and surreal comedic voice. Blending overt absurdism, sharp wit, goofy sight gags, juvenile jokes, and atypical vocal performances, the writers engender a multilayered sense of humor that plays equally strong to kids and adults. Actually, at times it might even play stronger to adults. Fantastical situations are often undercut by mundane reactions or problems, placing a hilariously ordinary spin on the show's larger-than-life scenarios. Non sequiturs and silly observations are the norm, and under the writers' careful hands, even immature gags involving farts and pee somehow seem intelligent. Well, almost intelligent. There's even a faintly risque and subversive undertone to some of the comedy and situations (particularly the romantic ones) and the series can get a little dark and borderline disturbing in some instances -- but the creators approach to this potentially adult material is so endearingly innocent and harmless in execution that the show never becomes inappropriate. Complementing all the clever word play and comedy is a simple but beautifully realized hand drawn animation style that evokes an endearing sense of crude innocence and magical charm. Though not especially detailed, the cartoon visuals are still very dynamic and expressive, and the animators frequently create comedic and dramatic emphasis through extreme, intricate close-ups that provide a stark contrast to the usually modest character designs. Likewise, backgrounds are often layered with subtle details in the environments that add another level to the settings' sense of character. This all comes together to form a totally immersive atmosphere that fully brings the land of Ooo and its eccentric inhabitants to life. Speaking of eccentric inhabitants, the cast of characters is absolutely brimming with personality, and the voice actors are all top notch and pitch perfect in their roles. Jeremy Shada gives Finn just the right amount of naivety, immaturity, and staunch bravery. The character has a strong moral code and embodies true heroism, but at the same time he's still just an inexperienced little boy prone to normal kid problems and behavior. As Jake the dog, John DiMaggio is the ultimate best friend. His laid back, fun-loving attitude is infectious, and the core friendship between the canine and his human companion becomes the crux of the show. Special note must also go to Tom Kenny who plays Finn's most prevalent foe, the Ice King. Despite being a frequent antagonist to the show's heroes, the frosty wizard really isn't a bad guy –- he's just incredibly pathetic and lonely, and often goes about trying to find love and companionship in the worst (and most hilarious) ways. Kenny's vocal work is simply superb, and he goes on to craft one of the series' most complex and oddly likeable characters. A lot of the show's irregular comedy beats end up resting wholly on the performances, and the nuances in the cast's line readings are perfectly attuned to the eccentric style of comedy. As with any series with such a distinct voice, the show's very specific sensibilities might not be everyone's cup of tea, and its random, unconventional storytelling rhythms and strange sense of humor could prove annoying or pointless to some. With that said, I couldn't be more enamored by the imagination on display here. Like Pixar, the series' writers have found a perfect equilibrium between kid-targeted fun and surprisingly intelligent humor –- but unlike Pixar's decidedly mainstream approach, the tone here is much more offbeat and idiosyncratic. This is high quality short attention span storytelling at its best, proving that the ADD generation of kid's cartoons can still offer a few genuine gems. Though simple and seemingly random on the surface, there are real layers of depth here that go on to further develop an exceedingly rich mythology in future seasons. But even in its earliest stages, 'Adventure Time' is weird and wondrous in all the right ways, taking viewers on a truly magical journey that is oddly funny, heart warming, absurd, and compulsively entertaining. 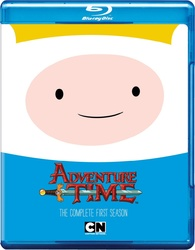 Warner Bros. brings 'Adventure Time: The Complete First Season' to Blu-ray on a single BD-50 disc that comes housed in a keepcase with a cardboard slipcover. In a fun little design choice the slipcover is shaped to look like Finn's trademark animal hat with a cutout circle exposing his face on the cover art underneath. When the slipcover is removed, the full cover art exposes the character's luscious blond locks. A code for an UltraViolet digital copy is also included. After some skippable trailers, the screen transitions to a standard menu. The show is provided with a series of 1080p/VC-1 MPEG-4 transfers in the 1.78:1 aspect ratio. Simple but wonderfully creative and vibrant, the animation style absolutely sparkles on Blu-ray. The series is presented with English Dolby Digital 2.0 audio along with optional English SDH subtitles. While it's a bit disappointing that the show doesn't get a surround or lossless presentation, these lossy 2.0 mixes actually sound pretty good. Warner Bros has put together an appropriately odd but entertaining collection of supplements, including commentaries and behind the scenes featurettes. All of the special features are presented in 720p with Dolby Digital 2.0 audio unless noted otherwise. Commentaries – Commentaries are provided on four episodes. Episodes two & three feature creator Pen Ward and voice actors John DiMaggio, Tom Kenny, & Jeremy Shada. Pen's mother Betty Ward and voice actress Polly Lou Livingston sit down together for episode four. Finally, episode seven features Pen Ward and voice actors Jeremy Shada, Tom Kenny, Hynden Walch, and the great George Takei. As a whole, these tracks are appropriately chaotic as the energetic group jokes around a lot. Kenny proves to be the voice of reason and helps to steer the conversation by asking specific questions, but the gang does spend a bit too much time simply watching the show. Surprisingly, Pen's mom turns out to be the most informative participant, and she shares lots of stories about Pen's early artistic endeavors in her comparatively subdued and focused commentary. Though not exactly packed with information, these all make for a fun listen. Behind the Scenes (HD, 10 min) – As one might expect, this little featurette is far from typical. Pen takes us on a tour of the production office using a camera phone and a mini steadicam that he repeatedly reminds viewers he "bought off the internet for like 150 bucks." As we meet various crew members a tiny animated Finn suddenly appears and starts to wreak havoc. Filled with random oddness, this is a bizarre extra that fans of the show should enjoy. Behind the Behind the Scenes (HD, 3 min) – Here we get a very silly pretend making of featurette for the previous behind-the-scenes supplement. Though there aren't any real insights into the show, I'll take goofy little clips like this over standard fluffy promotional pieces any day. Adventure Time Music with Casey & Tim (HD, 10 min) – This is an unconventional interview with the show's composers discussing their style and approach to specific episodes. Animatics (HD, 48 min) – Animatics for episodes 1, 5, 18, and 23 are viewable separately or together along with commentary by creator Pen Ward, storyboard artist Adam Muto, creative director Pat McHale, and executive producer Derek Drymon. The group jokes around about numerous animation difficulties and details cut material and inspirations for certain characters and plotlines (a lot of story ideas seem to come from Dungeons and Dragons). At one point, there's even a mini commentary within the commentary as we are treated to an incomplete short film made by Pen Ward back in college. Music Video (HD, 2 min) – Presented in 1080p, this is a silly music video that features a live action take on the show's characters. Finndemonium (HD, 2 min) – Presented in 1080p, this is brief reel of clips that show off the show's rabid fandom with fan art and cosplay. The Wand (HD, 2 min) – Presented in 1080p, here we get an amusing short that features Finn and Jake finding a magic wand. 'Adventure Time: The Complete First Season' offers viewers a strange, hilarious, and effortlessly delightful introduction to one of the most unique and entertaining shows on TV. Fun for both kids and adults, the series appeals to all ages and is full of quirky creativity, wondrous imagination, and offbeat humor. The video transfers are very strong with great pop and bright colors, and while not lossless, the audio mixes are actually very effective. The included supplements are all appropriately strange, and while real insights into the show's production aren't as comprehensive as I would have liked, fans should be pleased with the silly extras. With fantastic stories, amusing special features, and a great technical presentation, this is a wonderful release for the cult favorite cartoon. Highly recommended.